Scrapbooking materials - Memories made easy -scrapbook pages - baby; Recollections scrapbooking photo pages, "Memories made easy". The kit includes 6 heavyweight, acid- free sleeves, with die cut ope..
Scrapbooking materials - Memories made easy -scrapbook pages - baby; Recollections scrapbooking photo pages, "Memories made easy". The kit includes 6 heavyweight, acid- free sleeves, with die cut openings for photos. Each 11" x 17 " insert folds to 8 1/2" x 11" pre-drilled to fit either a 2- hole scrapbook, 3 ring binder or clear protective sleeves. Simply place the photos in the openings for the finished look. 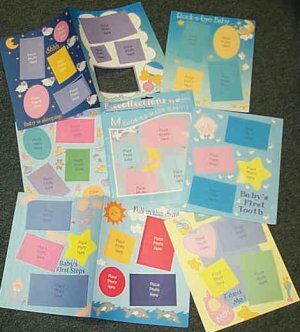 This kit has pages that have to do with a baby. (1st step, assortment of pages shown). Great for a beginner scrapbooker or an experienced scrapbooker. Great for a child who wants to learn how to start scrapbooking. Other types also available. Scrapbooks and stickers are also available. Great holiday gift for the beginner scrapbooker in your life (child/adult).